Wow...I could see them mounting a campaign for the film's technical aspects like visual effects and sound, even editing or cinematography (although that was aided significantly by computer), but Best Picture? Can't they think of better things to spend their time on? I guess it's appropriate though...seeing as to the film is about impossible odds and lost causes. And you've got to love Richard Roeper's orgasmic blurb at the bottom proclaining 300 to be the "Citizen Kane of cinematic graphic novels." Hmmm...has he not seen Ghost World? 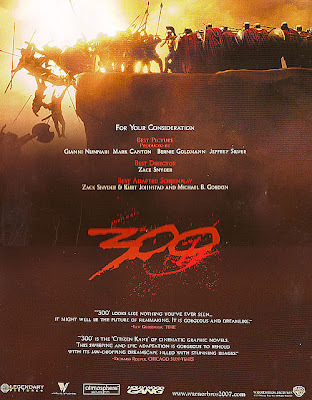 Okay, before someone points this out, I gave 300 a positive three-star review, which was probably a little too positive and half a star too many. It's not a bad film (neither is it a great one), and it's shamelessly entertaining and beautiful to look at, but Oscar material it is not.